How to add Google Analytics to your email campaigns in Tripolis Dialogue? 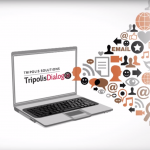 Home » Portfolios » How to add Google Analytics to your email campaigns in Tripolis Dialogue? If you have Google Analytics running on your website, it can be of great value to track the traffic to your website that is generated from your emailings. By connecting your Tripolis Dialogue account to Google Analytics you can easily tag your hyperlinks with tracking variables to track how well each mailing performs on your website. This lets you optimize your efforts and track your Return on Investment.